Autoflowering cannabis varieties automatically switch from vegetative growth to the flowering stage with age, as opposed to the ratio of light to dark hours required with photoperiod dependent/short-day strains. Many autoflowers will be ready to harvest in less than 10 weeks from seed. Dwarf varieties can have short stature while still giving decent yield. Conversely “super autos” can take over 100 days to mature and can reach over 6 feet tall. Online vendors offer, as of January 2012, nearly 200 autoflowering strains, being the most sold varieties in the market: Autoflowering Blueberry, Cream Caramel Auto and Afghan Kush Ryder. Most of these strains can be identified by the presence of “ryder” (such as Afghan Kush Ryder by breeder World of Seeds) or “automatic” (or “auto” such as with the Auto Ak47 bred by Lowlife) in their names. There continues to be some short-day cannabis growers that insist that autoflowers are simply a fad and produce subpar drugs. The number one reason for these feelings are the understandable disappointment many had with the results of the first Lowryder. Also commonly argued is that when growing indoors, growers already have the ability to initiate flowering with photoperiod/short-day plants at will by changing the lighting. Hormones such as BAP and paclobutrazol can also be used to completely arrest vertical growth in photoperiod plants. There are however concerns about the carcinogenicity of some of these growth regulators. When growing outdoors, initiation of flowering in short-day plants is more difficult to control than with autoflowers. Another concern is the overall yield of autoflowering plants which with some dwarf strains can be a half ounce per plant. A SuperAuto, is a term generally misused by the general public. They aren’t a cannabis species, variety or type, they were a branding effort that became widely misunderstood. Here’s more common myth: (sometimes referred to as amazonian autos) starts flowering automatically only after a much longer vegetative period between 28/32 days most of the time. Just like other autoflowers changing the lighting schedule does not affect the flowering cycle of these strains. It is not unusual for SuperAutos to get over five feet tall with some becoming eight feet high. Creating true autoflowering seed from two quality, true breeding autoflowering parent plants is easy for most. Breeding new autoflowering strains becomes more difficult when attempting to make a hybrid with a non-autoflowering strain. Some photoperiod/short-day cannabis strains are heterogeneous – containing the recessive day-neutral or autoflowering genetics along with the dominant short-day genetics. However a proper list of such strains is not yet available so most breeders treat all short- day plants as homozygous dominant. Cannabis, Sir Ross (2015). Cannabis Botany and Marijuana Horticulture Naturally Medicinal. Maison Hydroponique Publishing. ISBN 978-1548501594. ^ Downs, David (15 April 2014). “How To Grow Organic Pot”. East Bay Express. ^ David, Steve (2 November 2011). “Hydroponics Autoflowering Marijuana: Seed to Harvest in 70 Days or Less!”. Big Buds. Archived from the original on 2014-04-26. ^ “The history of autoflowering cannabis seeds”. Canabbis.Info. 7 December 2017. ^ a b van Bakel, Harm; Jake M Stout; Atina G Cote; Carling M Tallon; Andrew G Sharpe; Timothy R Hughes; Jonathan E Page (24 October 2011). “The draft genome and transcriptome of Cannabis sativa” (PDF). Genome Biology. 12 (102). ^ 2015. “Best Auto Flowering Cannabis Seeds”. 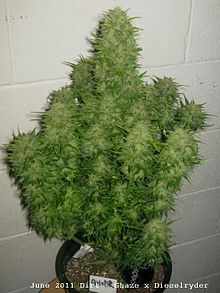 Howtogrowmarijuana.com Retrieved from http://howtogrowmarijuana.com/auto-flowering-cannabis-seeds/. ^ “The evolution of autoflowering genetics”. SoftSecrest International. May 2016. ^ “Autoflowering seeds”. April 2019. ^ Gabriel, Larry. 2011. “Beyond THC.” Retrieved from http://www.metrotimes.com/detroit/beyond-thc/Content?oid=2147981. ^ Midowo. “What are autoflowering cannabis seeds”. www.autoflowering-cannabis.com. Archived from the original on 2013-10-02. ^ Kemar. “Autoflowering Seeds”. paddyseeds.com. ^ Geber, Monica A. (1999). Gender and sexual dimorphism in flowering plants : with 29 tables. Berlin [u.a. ]: Springer. ISBN 978-3540645979. ^ Said, Nuff. “Cannabis Seeds and Basic Breeding”. ISmoke Magazine. Retrieved 25 April 2014. ^ “What are autoflowering cannabis seeds”. ^ “Autoflower marijuana seeds skip the slow blooming cycle”.